Data Binding: Internal logic improvements that move data binding support into the core spreadsheet models enhances performance, especially for common use cases involving calculations with bound data. Encrypted XLSX: Internal logic improvements moving encryption/decryption support into the core spreadsheet models enhances performance when importing or exporting password-protected Excel files. Design Time: We switched the default serialization logic for the control when saving the workbook in the form resources. This enhances design time performance, especially when using the Spread Designer tool to apply a large or complex template. Spread.NET 12 features a new exchangeable XLSX file format enhancement. The new ExcelSaveFlag and ExcelOpenFlag enumeration, available when saving or loading XLSX files using the Spread Designer or code in run-time, includes all custom Spread objects that previously would have been lost on export to Excel format (like cell types and column footers). Using the new Exchangeable XLSX file format, all custom Spread settings are preserved inside the XLSX as custom streams that are loaded back with the other contents on reload. Going forward, this new file format replaces the XML serialization supported by the control and will be vastly more efficient to use with much smaller file sizes. Spread.NET 12 features some big changes to the control's default behavior in new instances. In order to keep backwards compatibility with previous releases of Spread.NET, we've implemented support for a new design-time property named LegacyBehaviors, which enables a new set of special compatibility modes in run-time. These legacy modes are designed for upgrade users, and by default, control instances upgraded from earlier versions of Spread.NET will automatically use the LegacyBehaviors to maximize backwards compatibility for the upgraded instances. The default constructor for the spreadsheet control now creates the new instance using LegacyBehaviors.All, which enables all the legacy modes of operation, so all upgraded code using older versions that use that constructor will have maximum backwards compatibility. Four separate LegacyBehavior modes are available in Spread.NET Windows Forms 12, each of which can be enabled or disabled independently: AutoRowHeight, CalculationEngine, PropertyDefaults, and Style. The AutoRowHeight flag disables the new automatic row height behavior. The Calculation flag enables the legacy calculation mode, which makes all Date-related functions return the .NET DateTime data type as in previous releases, instead of the double data type as in Excel. The PropertyDefaults flag disables all of the new default values for properties to enable the new Excel-like behaviors described above. When this flag is used, all legacy properties implemented in earlier releases of Spread.NET keep their old default values, including the worksheet Protect defaulting to True and the cell Locked defaulting to False. The Style flag disables the new core-style model integration and new DefaultCellType rendering in the cells, and instead uses the legacy style models and GeneralCellType rendering of previous releases. First, change the project references to use the version 12 DLLs. Then update the licenses.licx in the project to reference the new version. All instances in your project will automatically use LegacyBehaviors.All, and your spreadsheets should operate as before. You can immediately start enhancing your projects to take advantage of the new APIs and features! Turn off LegacyBehaviors to enable the new features on a case-by-case basis. In design time, new instances are now created using LegacyBehaviors.None, which disables all legacy modes of operation and enables all new features of the control. Many new APIs based on the Visual Studio Tools for Office API are exposed in GrapeCity.Spreadsheet.dll in version 12. This new API layer powers the new feature enhancements in version 12 and provides an unparalleled level of control over every aspect of your workbooks. The IRange interface alone features 31 method overloads and 56 properties, and that’s just one of the hundreds of new types exposed in this vast new API layer. The control instance does not need to be inside a form to be used for opening, saving, or manipulating the contents of a workbook or set of workbooks. You can also use the APIs of the control to produce password-protected PDF or XLSX files. This can be important for satisfying security requirements for personal medical, financial, or other sensitive data. You can now reference cells and ranges in external workbooks and import/export those external references to XLSX. A WorkbookSet can contain many related workbooks that reference one another and recalculate in real time, and those workbooks can be attached to live instances of the control on the same form or on different forms. 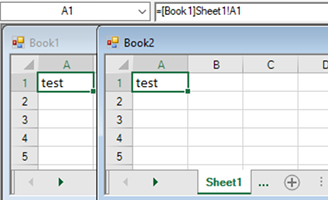 External references to unloaded workbooks work as in Excel. You can now apply one of 18 new language packages to the calculation engine, providing localized function names and syntax for structured references. 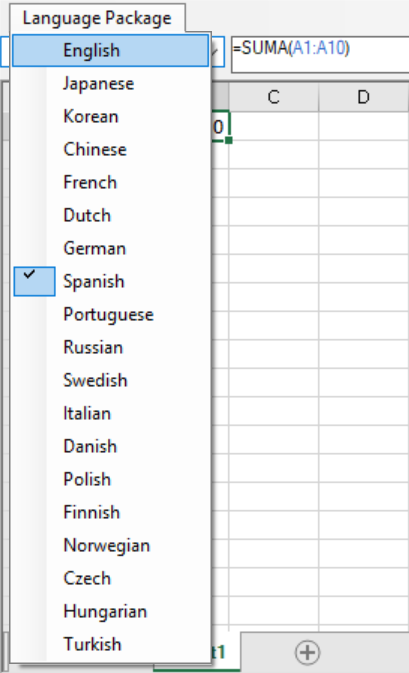 Your applications can easily apply any of these language packages to provide localized calculations, and even create custom language packages. Reference header and footer cells in tables and worksheets with dynamic headers! When you use formulas in the header and/or footer cell, you can refer to those formulas in other cells. In addition, you can import and export your workbooks with headers and/or footers intact. External variables are essentially custom classes that integrate directly with the calculation engine. With external variables, you'll be able to easily pass any variable--for instance, from a web service, stock value, instrument reading, or user input--as a value, and automatically recalculate all formulas on a page when the value changes. For instance, if a user implements formulas in the header cells that calculate dates, that formula could be referenced further down the page in a TextBox control. Developers could write some simple code in a new class to define the external variable, which would get its value from the TextBox control, and then flow through to the header cell. The code inside the class can do anything to define the value – call a web service, get some scientific instrument state for a lab book, whatever the customer needs. And it can notify the calculation engine when the value has changed, and dependent formulas need recalculated. Here's another example, where we'd use a dashboard. Say I'm building a business dashboard that includes a spreadsheet with sparklines, a treemap, a line chart, a pie chart, and a filter. The user selects a filter. The filter selection gets sent to the calculation engine. The engine immediately recalculates all of the charts and spreadsheets using the filter variable. All controls on the dashboard update with the new data. The new API includes full support for Office Themes, which means developers and end users can easily apply *.THMX files from existing Excel files with only a line of code. You can also create custom themes, and the API supports ColorScheme, FontScheme, and EffectScheme. Corporate users can easily apply their brand standards across spreadsheets and apps.